Thank you to everyone who helped plan SummerFest 2016! We are so pleased the weather cooperated as well as it did. Thank you also to the hundreds of people who attended. And finally, thank you to everyone who participated – all our vendors and entertainers. The event would not have been possible without you all. Visit our Facebook page and let us know what you thought, how we can make it better even next year. Also, be sure to check out our photo album from the event. The Chatham Area Business Alliance hosts Chatham SummerFest Saturday, July 9 from 10am-4pm. In celebration of its 40th year, organizers have planned the biggest and most exciting SummerFest yet. In addition to the popular village-wide sidewalk sale and Artisan Faire, more than 60 food and merchandise vendors and not-for profits organizations will be set up along Main Street, Park Row, and Hudson Avenue. Topping it all off will two stages of entertainment, one on each end of town. Renowned magician and master of sleight-of-hand Jim Snack will perform on the Spotlight Stage, located outside Chatham Brewing. This uniquely Chatham event features a parade of individuals wearing giant handmade papier-mâché heads that cover most of their body. In addition to the heads will be adults and kids in festive costume, musicians, floats and other surprises. All are welcome to march or watch. The parade kicks off from the Morris Memorial. “Three Billy Goats Gruff” is a reworking of the classic children’s tale performed by The Columbia County Youth Theatre, directed by Edgar Acevedo, with musical arrangements by Paul Wyatt. This will be the first time that there has been a live performance on the Crandell Theatre stage since the early 1950s. This internationally-acclaimed, Brooklyn-based, modern percussion quartet will perform on the Spotlight Stage, located outside Chatham Brewing. Champions of innovation and curiosity, they produce original music, as well as collaborate with others, and are well known for using original and exotic instruments including the glockenspiel, bowed marimba, aluminum pipes and an amplified cactus. Will be performing on the Spotlight Stage, located outside Chatham Brewing. For more information, please visit the website ChathamSummerFest.com. If you are interested in volunteering to help this community event, please contact Suzanne Knights at (518) 369-0541 or moc.l1556138532iamg@1556138532lreps1556138532ms1556138532. 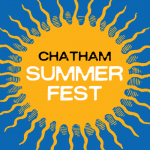 Chatham SummerFest will take place on Main Street, Park Row and Hudson Avenue. The street fair regularly draws hundreds of visitors and showcases many varied local organizations as well as performers, artists, and vendors. The Chatham Area Business Alliance (CABA), a coalition of individuals, businesses and organizations, works to promote the Chatham, New York region as a vibrant, positive environment for shopping, dining, enjoying the arts and conducting business. The third annual Best of Columbia County awards ceremony was held Thursday, June 23. More than 20 of the 90 categories were awarded to businesses, organizations and individuals from right here in Chatham, NY. Thank you to everyone who took the time to cast a ballot. 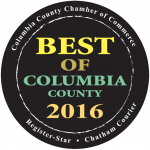 Congratulations to all of Chatham’s “Best of Columbia County 2016” Winners! We invite you to come visit our little town and see why so many of our businesses were voted “Best in the County!” The awards were announced Thursday, June 23, 2016. See the list of all 90 winners. Clothing, Shoes and/or Accessories: Browns Emporium, Inc.
Local Live Theater: The Mac-HaydnTheatre, Inc.
Realtor: Beach & Bartolo, Realtors, Inc. Please join us in our celebration of Chatham SummerFest’s 40th anniversary Saturday, July 9th, 2016 from 10am to 4pm. The event will take place on Main Street, Park Row, and Hudson Avenue in Chatham. Chatham NY has always been one of the most architecturally beautiful towns in Columbia County. Each summer Main Street, Park Row and Hudson Avenue turn into a lively ‘food, shopping and music’ festival and this year we hope to make it our best yet. We think that 40 years is a very big deal so we plan to make it a great event. There will be live entertainment on two stages and the streets will be lined with over 70 artisan vendors such as woodcrafters, jewelry makers, textile artists, makers of apothecary products and more. We’re sure there will be a little something for everyone. And we’ll have farm animals and face painting for the kids. Between the food trucks and our town’s great cafes, restaurants and brewery you’ll have lots of good eats to choose from such as Mexican, East Indian, and great American classics. Chatham is fast becoming a serious FOOD town! We can’t wait to kick-off summer and celebrate this special anniversary with you all. Hope to see you all at SummerFest 2016. Located about a half-hour up NYS Route 66 from Hudson, lies another of Columbia County’s great towns to explore, Chatham. Set among bucolic hillsides, the village of Chatham has seen a major resurgence in local businesses joining its longstanding community pillars, and is a destination for cultural, culinary, and conservation-minded tourists alike. From Nyack to Old Chatham, where artists, foodies and financiers shop for second homes. Read the article by Amy Gamerman. Just on the New York side of the Massachusetts border, the town is notable mostly for being beautiful and seeming far more remote than it is. Want the real country: farmland, horses, nobody in sight for miles? Head north — almost as far as you can go on the Taconic Parkway — to the town of Chatham. Read the article by Barbara Ballinger and Sara Greenberg. Travel HAVENS; Weekender | Chatham, N.Y.
LESS gentrified and touristy than Lenox or Great Barrington in the Berkshires and slightly more polished than the rural outposts of the Catskills, Chatham is a pastoral town at the northern edge of the Hudson River Valley. Read the article by Wendy Knight.